WASHINGTON (AP) -- The fate of Deputy Attorney General Rod Rosenstein could turn on whether President Donald Trump believes the account of an ex-FBI official who, as Trump once asserted in a tweet, had "LIED! LIED! LIED!" The president, at a Missouri rally Friday night, said there was a "lingering stench" at the Justice Department that "we're going to get rid of." He didn't name names. Friday's news reports raised the prospect that Trump could fire Rosenstein. Any dismissal could affect Mueller's investigation into possible coordination between Russia and Trump's presidential campaign. Rosenstein appointed Mueller and oversees his work. 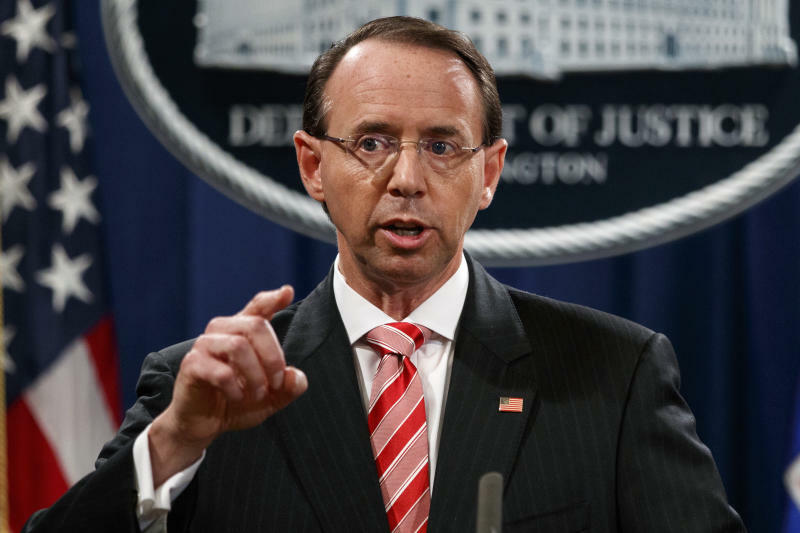 Rosenstein distanced himself from the White House soon after Comey's firing by saying his memo "was not a statement of reasons" for firing Comey. Comey, meanwhile, has criticized Rosenstein's role in the firing but has said Rosenstein has acted honorably since then. McCabe says he told Comey that he had authorized FBI officials to share information with a reporter in order to push back against a story McCabe felt was going to be unfair to the bureau and inaccurate. Comey has said McCabe did not acknowledge having done so and left the impression that he didn't know who had shared the information with the journalist. The person said a different memo about that day from another FBI official, Lisa Page, does not include the 25th Amendment reference. But another person with knowledge of the interactions, who also insisted on anonymity to discuss private conversations, said there were multiple meetings that day and that Page's notes are about a different meeting, which explains why her notes don't line up with McCabe's.